Ferry owner Peter Wells brings his dilemma to the Edgartown selectmen this week. A new movie about the late Sen Ted Kennedy’s infamous Chappaquiddick accident has caused an uptick in tourist traffic to the small island off Edgartown, Chappy ferry co-owner Peter Wells told the Edgartown selectmen this week. The movie Chappaquiddick, which revisits Senator Kennedy’s 1969 car accident that killed Mary Jo Kopechne, was released this spring. For sometime longtime Chappaquiddickers it is a bit of deja vu, since for many years following the accident, curiosity-seekers flocked to Chappy in search of the Dike Bridge. Mr. Wells said now tourists are out looking for both the Chappy ferry and the bridge. He proposed new signs to steer traffic in the proper direction. When visitors look for directions to Chappaquiddick or the Chappy ferry via Google, he said, they are often led astray down to the foot of Main street and all the way down Dock street, where one-way traffic comes off the ferry. He said that after half a year of “constantly pleading with Google” the directions were changed for the Dike Bridge. But Google directions still lead visitors the wrong way when they search for the Chappy ferry, he said. He is in the process of trying to get those directions changed too. He suggested signs indicating the vehicle route to the ferry with an arrow placed by Captain Porky’s Bait and Tackle on Dock street, to keep people from continuing on the wrong route. 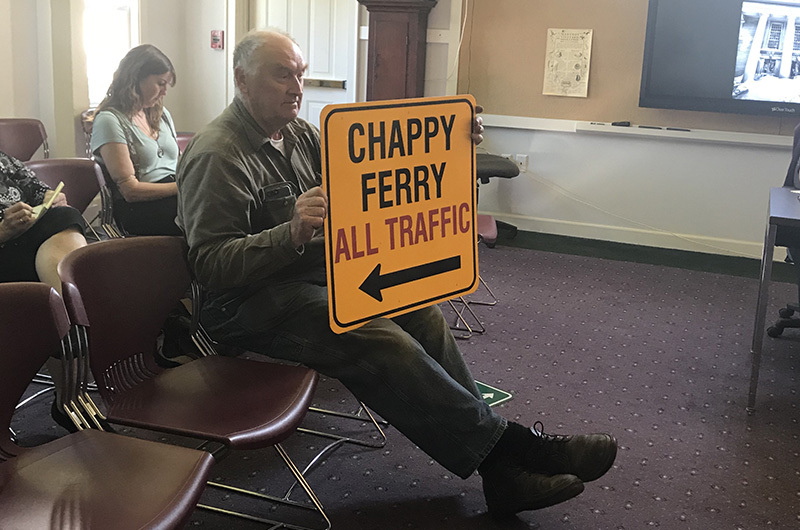 He said he’s trying to avoid direction signs that say Chappy ferry because they are often stolen as collectors items. “If I didn’t have a supply I might take one,” the longtime ferry captain quipped. Selectmen agreed the signs are needed and asked Mr. Wells to work with the police chief and highway superintendent to figure out the best solution.